Nystatin is an antifungal medicine. The active ingredient, nystatin, kills fungi and yeasts by interfering with their cell membranes. Nystatin is available as an oral suspension for oral administration. Nystatin is a prescription-only medicine. Nystatin oral suspension is used to treat internal fungal infections such as oral thrush. Oral thrush is an infection of yeast fungus in the mucous membranes of the mouth that is characterised by painful, white spots in the mouth and on the tongue. 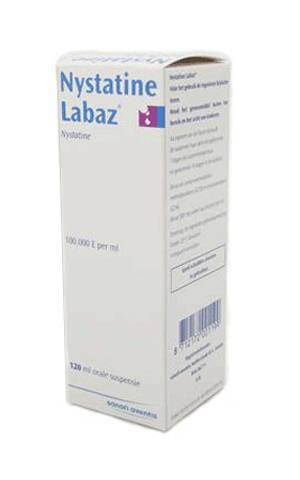 Nystatin oral suspension is also used to treat fungal infections of the throat, food pipe and intestines. Nystatin is only available as oral suspension (solution). It comes with a dosage syringe for measuring and administering the correct amount. Do not take the suspension with food, but in between meals. Try to space the doses evenly throughout the day. The duration of treatment and dosage should be determined by a doctor. In most cases, a one or two-week course will be prescribed. Always complete the entire course. Stopping early could cause the infection to return. Adults, children and babies: 1 ml of the suspension dropped into the mouth four times a day. The suspension should be held in the mouth for as long as possible before swallowing. Do not rinse your mouth. Skin rash due to allergic reaction. Consult a doctor if the side effects are severe or persistent. For more information, see the package leaflet. You are allergic to nystatin or any other ingredient in this medicine. Nystatin may interact with other medicines, such as antacids. It is therefore important to tell the doctor what other medicines or dietary supplements you are taking when you order. For more information on interactions and contraindications, see the package leaflet. Nystatin is safe for use by pregnant women and nursing mothers, provided the maximum recommended dose is not exceeded. This medicine does not interact with alcohol or affect your ability to drive safely.